Virtual reality (VR) technology that improves workplace training safety was showcased at the Melbourne Knowledge Week event this month. 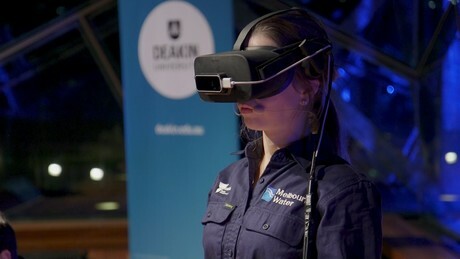 Developed by Melbourne Water and Deakin University, the technology allows users to interact with one another in the same virtual space from anywhere in the world. The platform has been purpose-built for Melbourne Water to allow its technicians to safely conduct training on the management of highly toxic chemicals, without the inherent safety risks. “We are using virtual reality to change the way we train technicians and eliminate safety risks,” he said. “The platform is initially being used to train staff on management of ozone, a dangerous chemical used in the wastewater treatment process. Ozone is 10 times more deadly than chlorine, so this platform allows our technicians to learn without being exposed to those risks. The dual user system means the training can be conducted anytime, anywhere — the trainer and the trainee never have to be in the same physical location. “Just like Keanu Reeves learnt Kung Fu in The Matrix, our technicians can now learn everything necessary for a given task in an entirely virtual world,” said McMillan. “We have built a solution to connect people who need to learn a critical task with those able to teach it, no matter where they are,” he said. “Multiple users can walk around in the same virtual environment and communicate with each other verbally and physically, just as you would in the real world.